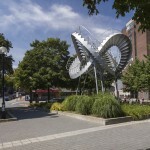 Michel de Broin holds a bachelor’s degree in visual arts from Concordia University and a master’s degree in visual and media arts from the Université du Québec à Montréal. He uses metaphor to offer reflections on the public, social, and political spheres. The temporary and permanent public art projects that he has produced are imbued with this quest, such as Overflow (2008), a chapel window that he transformed into a waterfall for the Nuit blanche event in Toronto, and Superficielle (2004), a huge mirror sculpture installed in the Alsatian forest. Residencies, such as those at the École nationale supérieure d’arts de Paris-Gercy and the Villa Arson de Nice, have enabled him to exhibit his work in France, the United States, Germany, and other countries. Révolutions encapsulates the neighbourhood’s specific visual references. 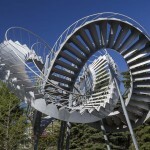 To the obvious reference to the typical Montreal outdoor staircases is added the stairway to the Métro station that is under the artwork, the metal structures of the Jacques Cartier Bridge, and the rides in the La Ronde amusement park nearby. 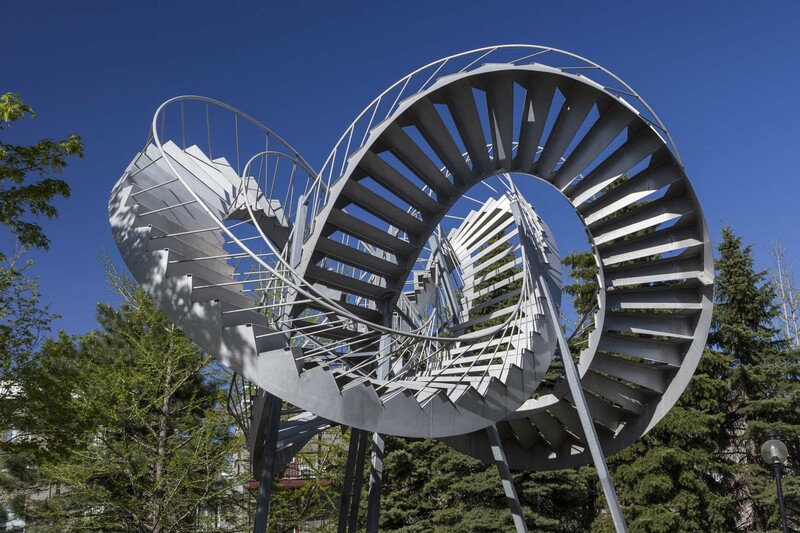 The aluminum sculpture also evokes universal symbols such as recycling (the Moebius strip) and infinity, as well as art history in its allusion to Vladimir Tatline’s Monument à la IIIe Internationale. With its multiple references, the knotted staircase is presented as an enigma in the space. The artwork offers a transition from utilitarian to non-utilitarian, from real to poetic, from banal to sublime. It is a “revolution” in the sense of a continuous cyclical motion turning around itself. The artist, who has had numerous permanent and temporary artworks on display in the public spaces of Montréal, generally points to a political meaning via metaphor. Here, creating a dialogue between the two meanings of the word “revolution,” the artwork may be understood as advocating for change within continuity rather than in rupture. 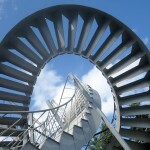 In de Broin’s view, “The staircase makes us think of what returns without repeating, transformed in its cycle. We can all project ourselves into this curved space and enter the game of revolutions” (2003).